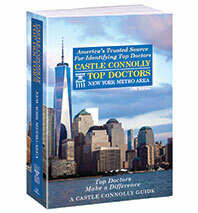 A New York City research and information company, Castle Connolly Medical Ltd., publishes an annual guidebook titled Top Doctors: New York Metro Area, which lists those whom Castle Connolly considers among the top 10 percent of the region’s physicians— 6,448 in all. For the past 16 years, Castle Connolly has been providing New York Magazine with a shorter version of this list for the magazine’s Best Doctors issue. Space prohibits New York from publishing the full list; this year, the doctors on our list number 1,251. The firm conducts a peer-review survey. The idea is that medical professionals are best qualified to judge other medical professionals, and if one recommendation is good (think of your doctor referring you to a specialist), multiple recommendations are better. Licensed physicians vote online (castleconnolly.com/nominations) for those doctors they view as exceptional. Participating physicians are asked to nominate those doctors who, in their judgment, are the best in their field and related fields, taking into account not only professional qualifications and reputation (education, residency, board certification, hospital appointment, and disciplinary record, for example) but also skills in dealing with patients (listening and communicating effectively, demonstrating empathy, instilling trust and confidence). Doctors cannot nominate themselves, and all nominations are confidential. The Castle Connolly physician-led research team then tabulates the results and vets the nominee pool, confirming the doctors’ board certifications and licensing, and investigating their disciplinary histories. Yes. The list is first adjusted for geographic balance. Because both Castle Connolly’s book and the list New York publishes are meant to help patients find doctors in their communities, Castle Connolly includes at least some top doctors from each relevant geographic area. On the one hand, this makes the list useful to the greatest possible number of New York readers; on the other hand, as a result of the concentration of excellent doctors in Manhattan, it forces some Manhattan doctors off the list. Second, Castle Connolly strives for balance across specialties. Top doctors in popular specialties, therefore, might be left off in favor of a few in less populated fields. Keep in mind, though, that all the doctors listed, regardless of location or specialty, are included because they came highly recommended by their peers and that all were thoroughly screened by Castle Connolly. If my doctor is not on the list, does that mean he is not a great doctor? No. The selection of doctors by peer ­review—and the compilation of a list that considers diversity of specialties and geography—­inevitably leaves out many outstanding doctors. Many doctors do, but there are many new doctors on the list each year, too. Because established, well-known doctors are exactly that—­established and well-known—the list may favor that kind of physician. That may mean fewer new choices each year, but it also means the list is inherently conservative. Given the importance of choosing a doctor, Castle Connolly and New York view that as a healthy bias. How can I see the full list of 6,448 doctors? The 17th edition of Castle Connolly’s guide to the best in our area ($34.95) is available for purchase online at castleconnolly.com.